At last count, there were 3,786 teams who began summer ball hoping to win the big one in North Carolina. The Desert Oasis Aces finished second, losing the American Legion World Series championship game 1-0 in extra innings. The Desert Oasis Aces celebrate after their 10-0 victory in five innings over Meridian, Idaho, at Veterans Field at Keeter Stadium in Shelby, N.C., on Thursday, Aug. 16, 2018. Lucas Carter/The American Legion. — In American Legion, many players have facial hair. In Little League, only a few of the big kids do. — A 200-foot flyball in a Little League game is a home run. In American Legion, it’s a pop-up to shortstop. — In Little League, the kids who win or even just make it to Williamsport usually ride a fire engine during a parade in their honor when they return home from Pennsylvania. In American Legion, most players would rather chase girls in their old man’s Buick than ride on a fire engine. But usually there is little fawning over the big kids when they return from the Legion World Series, mostly because they immediately must pack their things and head off to college. That should not diminish what the Desert Oasis team accomplished in Shelby, North Carolina. 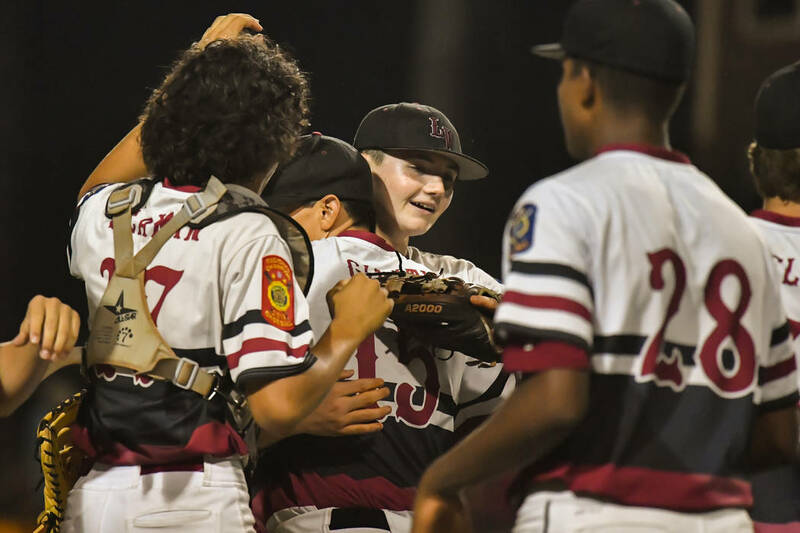 The Aces nearly won the American Legion national championship Tuesday night, losing 1-0 in extra innings to a side from Delaware. It was the third time in 11 years that a Las Vegas-area team had advanced to the championship game. The Southern Nevada Blue Sox, representing Basic High and Henderson Post 40, won last year; the Southern Nevada Titans (Post 76), made up mostly of Bishop Gorman players, triumphed in 2008. But compared to Little League, American Legion teams here and elsewhere play in a vacuum. Remember how everybody went nuts when the Mountain Ridge kids made it to the 2014 United States championship game at the Little League World Series before being eliminated by a team from Chicago (and beyond; the Jackie Robinson West team was forced to forfeit all victories for using players outside its area)? There weren’t many viewing parties for the Desert Oasis Legion team. For starters, most people don’t know how to get ESPN3 (which carried the opening rounds via live streaming) on their home computers. 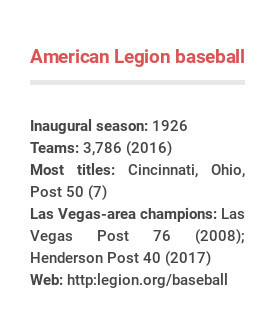 The American Legion World Series has been around longer than the Little League one, having crowned its first national champion in 1926. Little League didn’t offer a World Series until 1947. While Legion baseball has had 74 graduates attain the Hall of Fame, Little League has produced only 25. Little League still is way more popular. There are few analogies in sports where the little guys resonate more than the bigger guys, with the possible exception of the Westminster Kennel Club Dog Show. Judging from the crowd reaction, the toy group is much more celebrated than the hound group at The Garden. “It’s easier to sell an 11- or a 12-year-old; he looks much cuter in his uniform,” said Gary Mouden, who stepped down last season as the local Legion commissioner, ending 63 years of involvement with American Legion baseball as a player, coach and administrator. That word — dwindled — also would describe participation in Little League and American Legion baseball over the past decade. Travel ball and alternate leagues have greatly reduced the number of teams competing under both banners. Parents of Little League kids and girlfriends of Legion players may not want to hear this, but it’s a lot easier to qualify for the World Series than it was when Bob Feller and Ted Williams were playing. Mouden posed the $64,000 question, which would be the $601,803 question in 2018, allowing for inflation. But here’s a tip of the batting helmet to the Desert Oasis team anyway. At last count, there still were 3,786 teams who began summer ball hoping to win the big one in North Carolina. The Aces finished second, losing 1-0 in eight innings. They won’t be riding on a fire engine but it still was a heck of a season.